We get it. You’re pragmatic. You’ll buy that deep cleaning and decluttering your house are important steps in a comprehensive home staging process that could help your home receive higher offers and sell faster. But what’s up with those staging recommendations like making your bathroom feel like a spa and your kitchen smell like Rachael Ray just stopped by? Is that froufrou stuff really worth your time? It is. Actually, the fact that you’re a pragmatist is the reason you’re going to want to shell out for some luxury staging items. The science is in: You’re not just selling your home, you’re selling a lifestyle, and those fancy final touches make a powerful sales pitch. That’s right. Although the $11,000 you spent on a sturdy new roof might help seal the deal after the inspection, a gorgeous $30 jar of bath salts could be what prompts the offer in the first place. There are plenty of rational reasons for a buyer to want to purchase your house — that new roof is just one of the many. But according to Peter Noel Murray, Ph.D., in “Psychology Today,” decision making and emotions are inescapably intertwined. So much so that people with brain damage affecting the connection between emotions and rational thought are unable to make decisions, even with a clear set of pros and cons before them. What’s more, functional magnetic resonance imaging, or fMRI, results have confirmed the active role emotions play in consumer decisions about brands. How else can the overwhelming success of brand names over generic products be explained when generics are often the exact same thing? People want to be associated with the brand that feels more upscale, or as Terrylynn Fisher, a REALTOR® with Dudum Real Estate in Walnut Creek, Calif., says, “Everyone aspires to have more than they have.” In a 2007 study, researchers found that people’s enjoyment of wine increased in tune with the wine’s perceived price — even when it wasn’t actually expensive. Think of your home as the luxury, brand-name product, and all of the other houses on a buyer’s list as the generic version. Those homes might have a new roof as well, but when it comes to falling in love with a house, it’s that fancy label — aka, the chic bath salts or fancy wine decanter on display — that could make all the difference. Of course, different brands have different identities. How can you know that luxury is the right brand to convey to house hunters? In another “Psychology Today” article, Brent McFerran, Ph.D., explains that consumers’ desire to make luxury purchases is tied to their desire to showcase their accomplishments. What could be a better representation of someone’s accomplishments than their home? When a home appears luxurious, it promises aspirational home buyers the lifestyle they have worked so hard to earn. They deserve to live in a house with fancy wine decanters and an orchid in the bathroom. They’ve earned it. What’s that? Your home isn’t already laden with luxury goods? The good news is that it doesn’t take many luxury items — or any genuinely expensive ones — to create an upscale look for your home staging. Overstock discount stores like HomeGoods or Burlington Coat Factory are great places to find fancy, brand-name items like those bath salts or top-of-the-line bed linen sets at a bargain. When it comes to the staging items you were going to get anyway, sometimes the right item makes a subtle but impactful difference. In an article for “Houzz,” Kristie Barnett, known as “The Decorologist,” recommends overstuffed, oversized throw pillows. They’re not much more expensive than smaller pillows (a 26-inch pillow stuffed into a 20-inch cover from Ikea will run you about $15), and they add a seriously luxurious touch to the living room. Another inexpensive luxury tip from Barnett: Paint interior doors black. Who knew your doors were one cheap, easy coat of paint away from seriously chic? Finally, when choosing luxury items for your home staging, be sure to focus on the lifestyle you’re promoting. 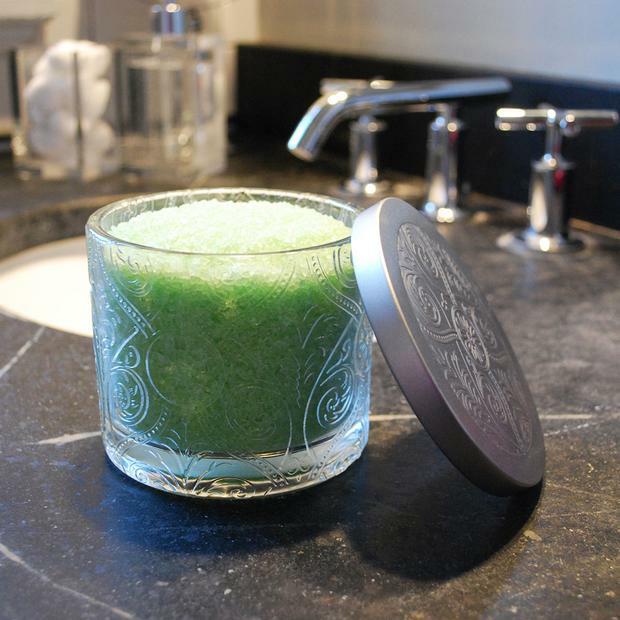 Yes, those bath salts in that elegant glass jar are beautiful on their own, but the reason you’re using them is to recreate the feeling of a spa in your bathroom. Support that beautifully scented splurge with fresh, white towels, decorative baskets, and maybe even a small bamboo plant. Sound like the kind of bathroom you’d like to call home? With any luck, that’s what house hunters will think too. You already know your well-maintained home is the best rational choice for the right buyer; this easy staging strategy can make it the obvious emotional choice as well. There’s nothing like a little note of luxury to tug at their hearts and help them envision your house as their future home.